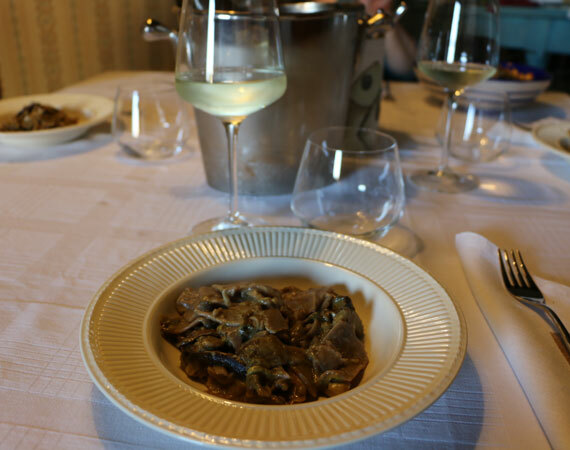 On a recent Friday morning, I had the opportunity to join in on a tour by Conquibus that takes you across Florence to discover artisan shops, traditional food markets and shops and then get your hands busy making a Tuscan meal. On this morning, the day starts off in the Oltrarno since that is where Stacie, my travel companion this day, is staying. We meet up with Claudia and Leonardo, our hosts for the day, who delineate what the day ahead looks like: breakfast to start, then a visit to the workshop of a local artisan before we proceed to the food market to get what we need to prepare our meal at Claudia’s cooking class. 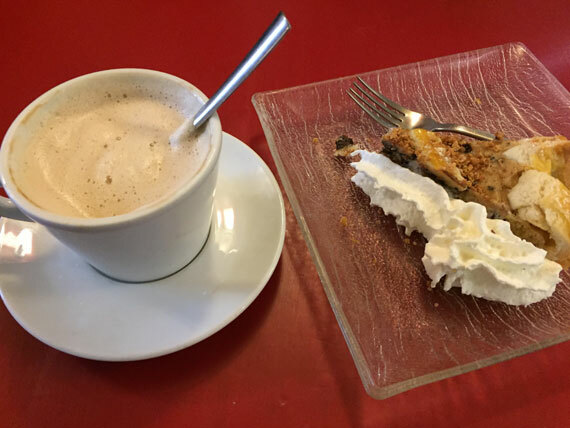 We head to nearby Caffe degli Artigiani on Piazza della Passera for a delicious slice of cake and cappuccino. You can, of course, skip the cake, but I wouldn’t recommend it. See how yummy it looks? It was delicious! Ricotta and apple. Don’t be fooled by how tiny the cafe shop looks from the outside, as it has a small dining area in the back. 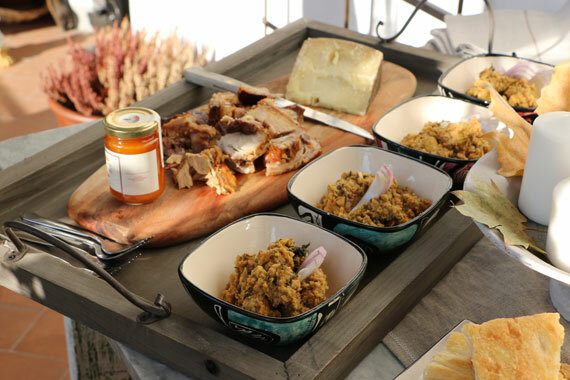 Enjoy the delicious start to the day! 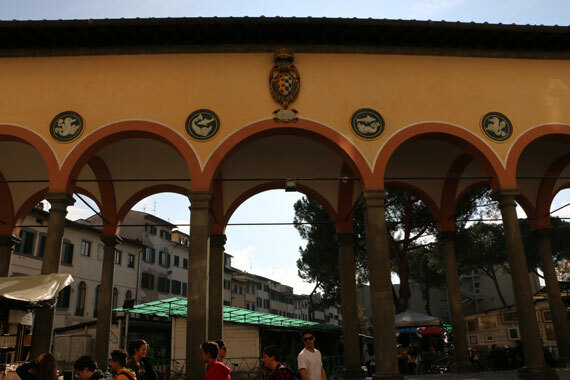 Ratafìa Firenze – if you’re wondering whether the name means something in particular, it does! Ratafìs is both a liquor as well as cited in a song, Diavolo Rosso, by Paolo Conte. They chose it because of the passion of the song, of course! 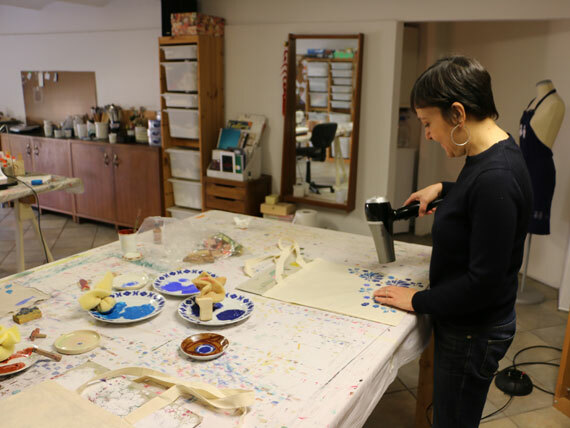 Then on to Ratafià Firenze, a family-created and run workshop of artists painting on textiles. 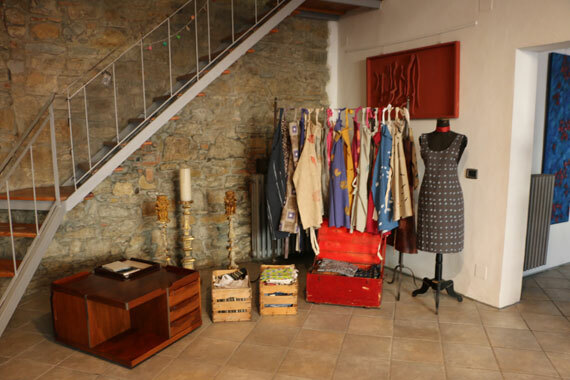 We are met by Valentina, who runs the shop with her sister Laura, who is introduced as Titti. 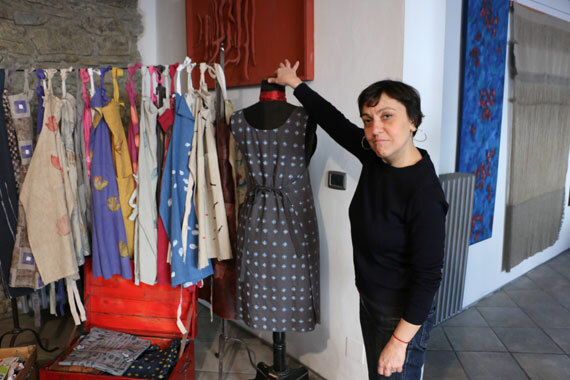 They hand make unique items for the kitchen such as aprons and potholders, bags, home furnishings, and clothing such as socks and shirts. 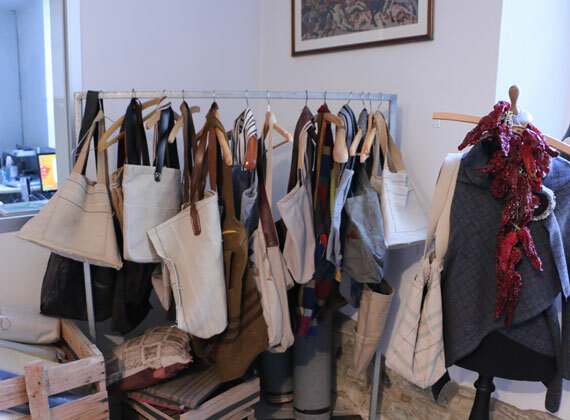 All in natural fabrics such as cotton, linen and hemp which is really sturdy like canvas. 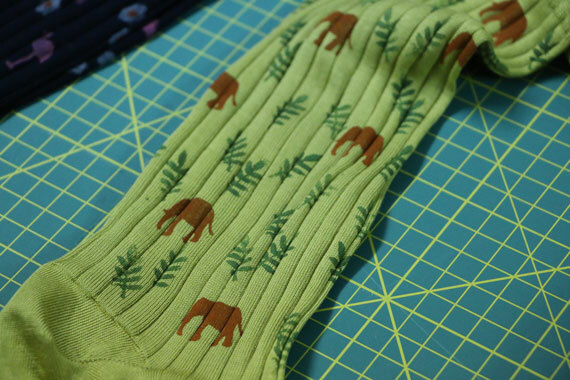 Elephants on your socks? Yes, they are cool! How about some pink flamingos? 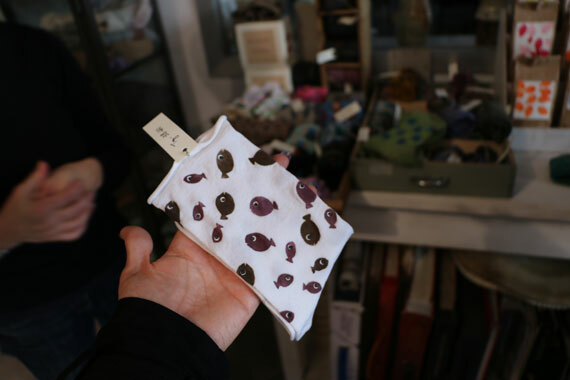 They make their own paints (their father is a chemist), dye their own cloth and then cut and sew up their products before painting them to create original, one of a kind items which make perfect presents, whether for others or yourself! 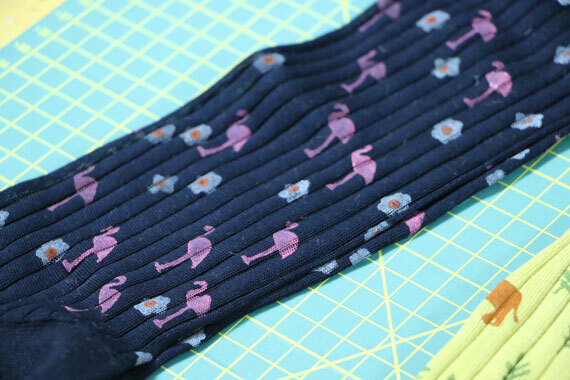 I thought the socks were really very cute, loved the elephants and the flamingos! 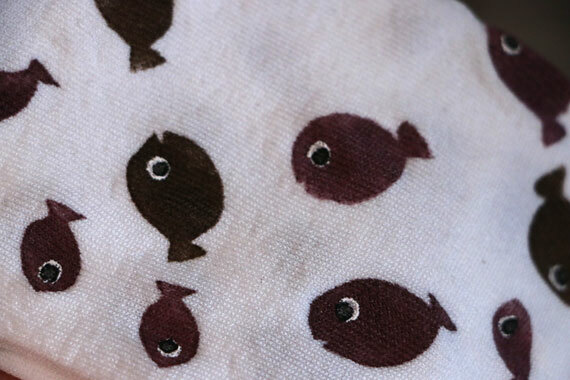 I also really liked their t-shirts with fishes, which I had to get in the form of a small t-shirt for my toddler, who is loving having orange fishes swimming all over her shirt! 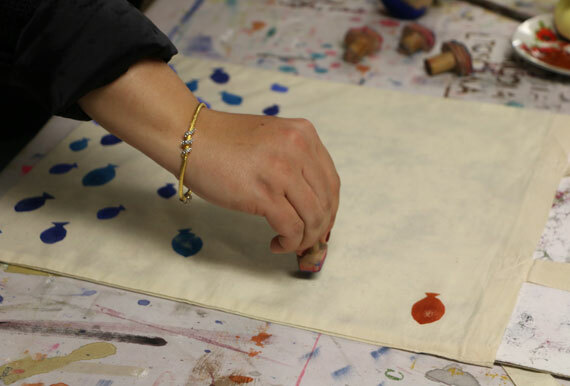 Stamping on canvas was like going back in time to doing crafts at school! 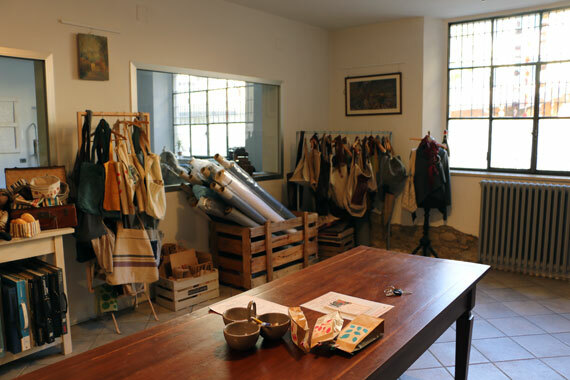 Ratafià is both a shop and their workshop, so Valentina took us upstairs to see their work area. Here, we also met Alda, their mother. Showing us various items in the process of being made, I then discover that we get to try our hand at what they do! Stacie and I got to try our own creativity on a blank canvas, in this case, a cloth shopping bag. Then Valentina dried it out, putting the finishing touches, a Conquibus logo on the back. 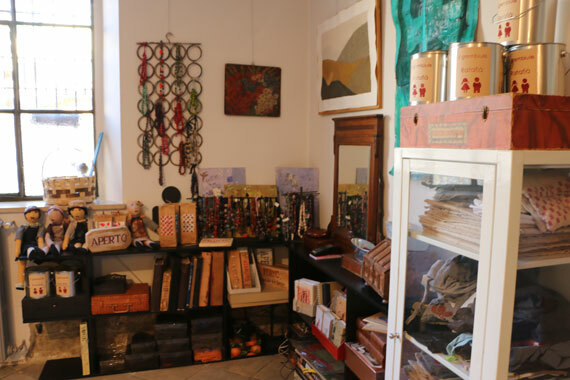 Ratafià is open by appointment only and they also offer the chance to go for a whole afternoon or morning and design and paint your own item, which would make a perfect souvenir to have from Florence! 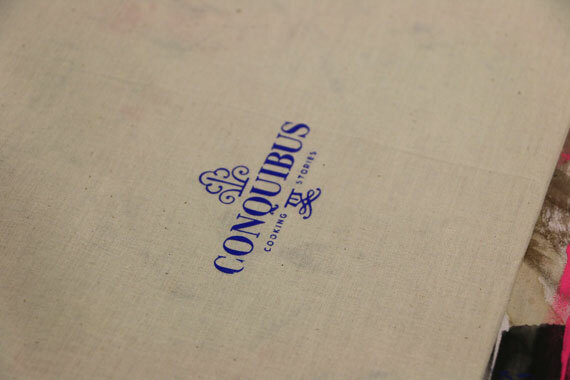 A Conquibus logo to complete the bag! Valentina and Titi showing us how to apply paint to the wooden stamps (all designed and cut by them). 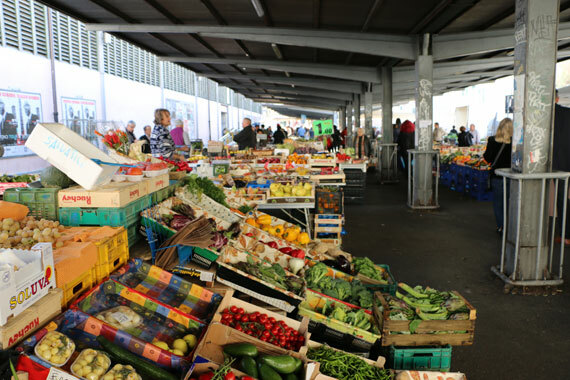 Next, we head to the Sant’Ambrogio market which Claudia says is considered to be the one remaining authentic of the two large food markets in Florence. 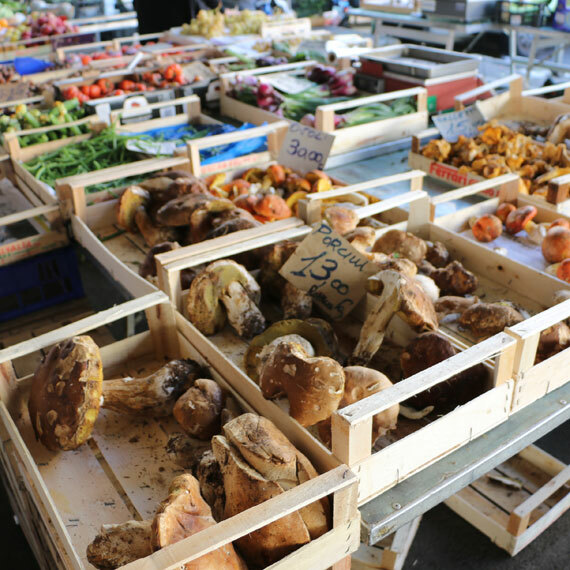 The food stalls offer a lot of color – and we enjoy admiring all of the types of mushrooms available! I admit I haven’t tasted some of these before. 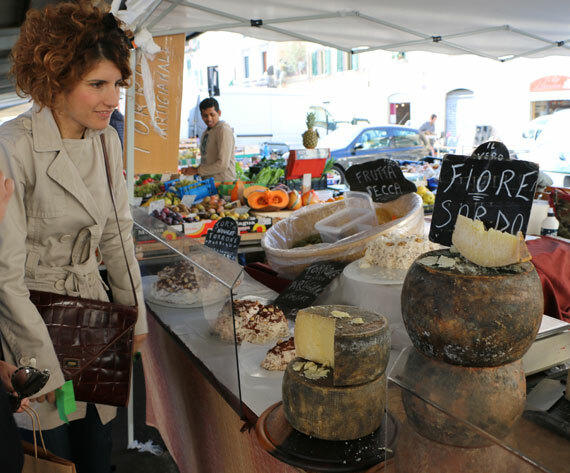 Claudia picks up porcini mushrooms and heads back home to start preparing the lunch class while we return at a more leisurely pace with Leonardo through the streets of Florence. Look at all those various types of mushrooms! 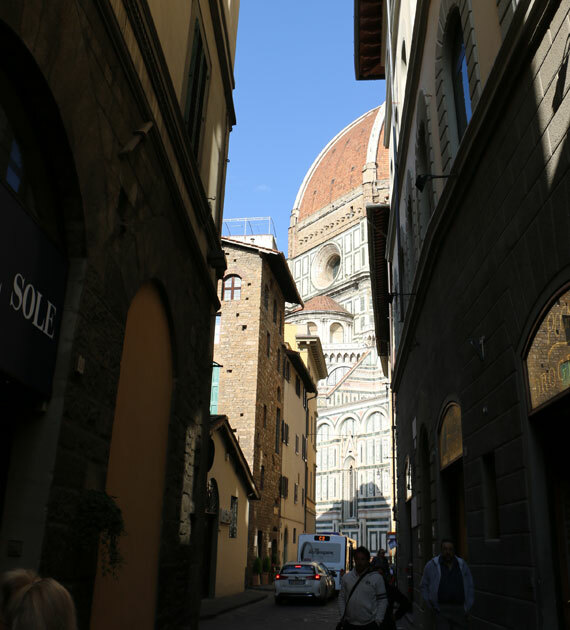 The walk towards the Duomo is not a tour of everything we see but more of a pointing out if interesting landmarks and some interesting facts by Leonardo. 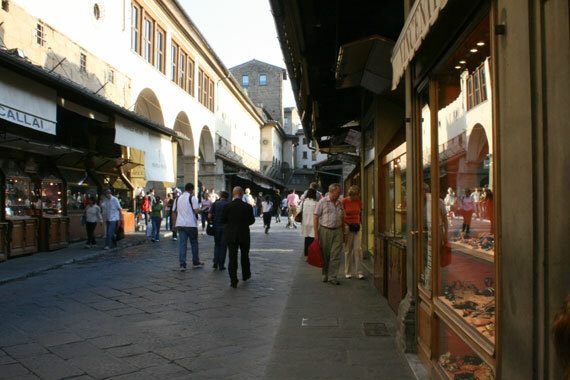 You can consider it as if you were visiting a friend in Florence that takes you around and shows you some of the sights. We make it to the Duomo, stopping briefly inside Pegna to pick up some bread and jam and then up to Piazza SS Annunziata. Leonardo and Claudia welcome us to into their home on Via dei Servi for the class and meal. Wow, have they got an awesome place with a great sun-filled terrace… with a partial view of the dome! Claudia, who is an opera singer as well as food blogger, is preparing ingredients for the various items on the menu while we start with some appetizers and wine. 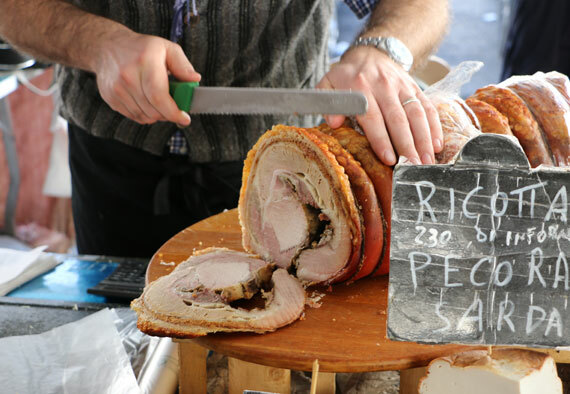 We enjoy ribollita prepared ahead of time by Claudia, and some focaccia and a piece of porchetta Claudia just picked up at the market…. all in our bellies before we start the cooking class. We make some delicious vegan apple muffins and then move on to the pasta. Made with chestnut and semolina flour, we roll out the dough to make “maltagliati“. As my first experience in making pasta, it turns out to be fun and very easy to do. Claudia has also prepared lots of cut vegetables to bake in the oven and shortly thereafter we can eat all of our creations. 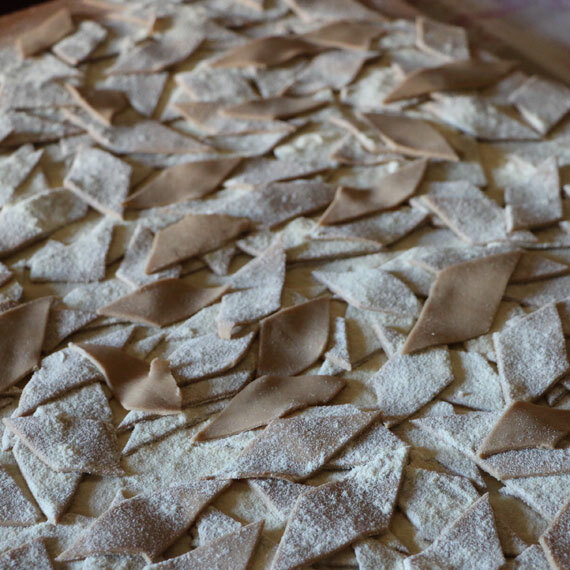 … to make “maltagliati”, badly cut pasta. Claudia shows us how to cut it easily using a pizza rolling cutter! 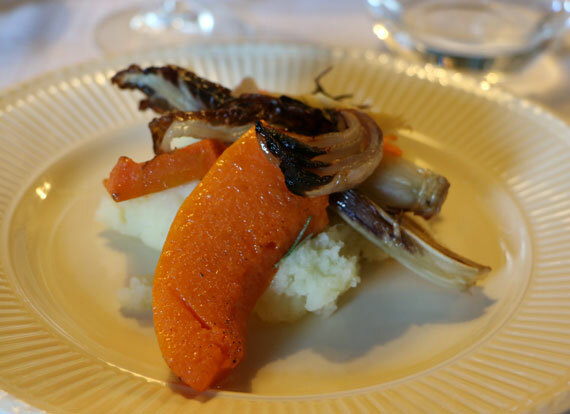 It is more of a cooking experience than a class as Claudia had already done a lot of prep for us, but explained along the way the ingredients we are using. Ingredients were all pre-measured and the pasta dough was already waiting for us, we didn’t chop any of the vegetables. 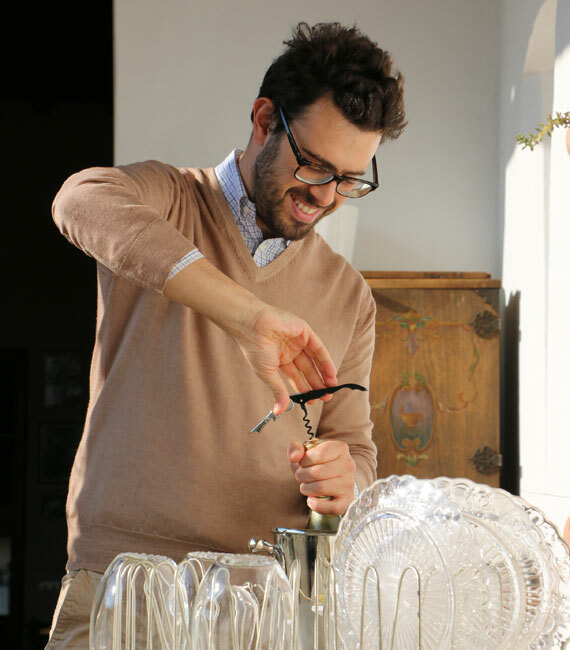 The experience is more that of helping to prepare a meal you are about to enjoy with friends. We chatted and shared our experiences about experiencing Florence for the first time (or second and more) and New York (where Stacie is from, sharing new novelties since I’ve been away from the States) and enjoyed a very good meal. It was a very enjoyable day out! 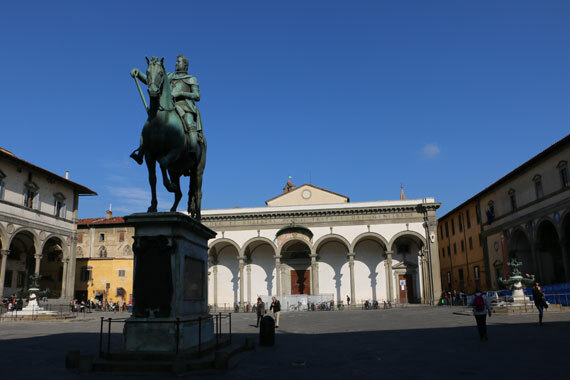 Your tour in Florence can vary depending on the availability of the artisans, which can include a ceramics workshop or jeweler or mosaic artist. I’d love to go back and try my hand again (since high school days!) at painting or creating something in clay ;-). For more details on the tour – and for great pictures of Claudia, Leonardo, the food and their home – check out their site www.conquibus.it.